Sears.com has Nakamichi Splashproof Wireless Bluetooth Speaker (Black: BTSP30) + $51 Shop Your Way Reward Points for $69.99. Shipping is free. Listen to your favorite music anywhere with the Nakamichi® Splashproof Wireless Speaker. Enjoy dynamic sound in a portable and splashproof design with Bluetooth connectivity. Powered by the magic of Bluetooth, this Bluetooth speaker lets you stream music from all of your favorite mobile devices, including smart phones, MP3 players, tablets and laptops. 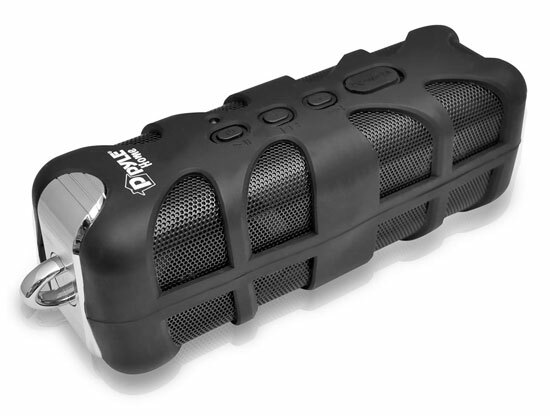 Splash-proof design and shock-resistant silicone wrap, is built for the outdoors. IPX6 splash-resistant tested and certified so can enjoy your music outdoors without worrying about rain, splashing water and snow fall.Nakamichi’s powerful rechargeable Li-Ion battery lasts for up to 7 hours on a single charge, so you can keep the party going from a.m. to p.m. both indoor & outdoor. Splash-proof design and shock-resistant silicone wrap, is built for the outdoors. IPX6 splash-resistant tested and certified so can enjoy your music outdoors without worrying about rain, splashing water and snow fall.